About Hyderabadi Biryani Recipe | Hyderabadi Chicken Biryani Recipe: One of the most popular biryani recipe, Hyderabadi Biryani is a dish from down the south but spread all across the country and even abroad. This flavourful and delicious gastronomic wonder is a treat to relish on and is often cooked for dinner parties in north Indian kitchens. Create it at home to make a mark at your dinner party! Ingredients of Hyderabadi Biryani Recipe | Hyderabadi Chicken Biryani Recipe:Half boiled rice layered with fried onions, mint, cooked mutton, sealed with dough and slow cooked 'dum' style. 1.Clean the meat. Now in a pan add meat, salt, ginger garlic paste, red chilli powder, green chilli paste, sauteed brown onions, cardamom powder, cinnamon, cumin seeds, cloves, mace, mint leaves and lemon juice. 2.Mix all of these ingredients thoroughly together. 3.Add curd, clarified butter, semi cooked rice, saffron, water and oil. Mix it well. 4.Now apply sticky dough on the sides of the pan. 5.Cover with lid to seal it and cook for about 25 minutes. 6.Hyderabadi Biryani is ready to eat. Garnish it with boiled eggs, sliced carrots, cucumbers and serve hot. You can prepare salan along with the biryani to serve as an accompaniment. 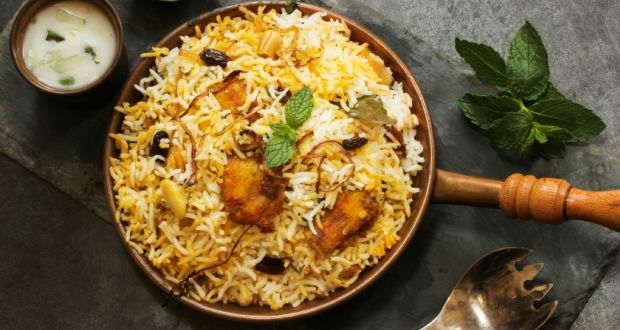 Soon, Hyderabadi Biryani in London? When I hear the names of Hyderabadi Biryani my mouth is watering, Because the taste of Biryani is unforgetable. It is so yummy and easy to make. Now some famous restaurants in Jaipur provide a delicious Hyderabadi Biryani. This biryani recipe has made my friends crazy. Love it ! authentic and delicious royal dish..